On February 24, 2010, Yoani Sánchez, the wellknown Cuban blogger and cyber-activist, was briefly detained (together with her sister) by state security agents in order to prevent them from signing a book of condolences at a service for the hunger striker Orlando Zapata Tamayo who had died the previous day. Not one to easily be deterred, following what she claims was an illegal and violent detention, soon after the incident Sánchez presented a formal complaint denouncing her treatment to Cuban authorities, including the Military Prosecutor, the Attorney General, the National Assembly of People’s Power, the police station where the incident occurred, the Council of State, and the National Headquarters of the National Revolutionary Police (PNR). At the time, however, the blogger did not make her detention public. Presumably, she did not want to detract attention from Zapata’s regrettable death, nor did she want to crate an “incident” or be unnecessarily “provocative” before allowing the Cuban authorities to answer her complaint. Anyone who has read Generación Y over the past three and a half years will have noted Sanchez’s great faith in the power of a wide and growing variety of information and communication technologies (ICT)—including blogs, Twitter, Facebook, You Tube, as well as internet-ready Flipcams and smart phones that can send SMS texts and e-mails and record voice, photos, and video. For her, these technologies have the potential to help “level the playing field” between authoritarian governments and marginalized citizens—whether they be Iranian voters, Chinese dissidents, or Cuban bloggers. She also clearly believes that such ventures into cyberspace can help these citizens begin to create more public space where they can exercise the full rights and responsibilities of true citizens. [There is] the hope that the Internet will empower political movements that can move Arab societies toward democratic values and governance. This study supports some aspects of the view that the Internet can empower political movements in the region, since it provides an infrastructure for expressing minority points of view, breaking gatekeeper monopolies on public voice, lowering barriers to political mobilization (even if symbolic), and building capacity for bottom-up contributions to the public agenda. But we caution against the idea that these functionally “democratic” characteristics necessarily travel in the company of classically liberal, historically Western, values regarding individual liberties, freedom of belief and expression, and, ultimately, secular foundations of political rights. The Internet lays a good foundation for a battle of ideas, but it does not necessarily favor a winner. Expanded access to the Internet does not move societies in a single direction, partly because different constituencies within any country view the potential of the web in different ways. Is the web a place to download democracy, boot up development, or plant the virus of dissidence and destabilization? Meanwhile, governments around the world have become wary of the security risks posed by increased and nearly universal connectivity with financial, military, and other secrets potentially exposed to malicious hackers often working at the service of their foreign adversaries. For them, the same web that could be embraced to boot up development, should also be feared as a potential “Trojan horse” where its enemies, real or perceived, can unleash the “virus” of dissidence and destabilization. The case of Cuba clearly illustrates each of these potentialities. For example, the Cuban government has recently expanded cell phone access (wireless accounts surged from just 200,000 in 2008 to more than 800,000 by early 2010) and drastically reduced prices (activation fees have been cut from $150 to $25) even if the regime is aware that its critics see such phones as a potentially destabilizing medium that could provide Cuban citizens with access to unfiltered information. “We’re going to keep working to provide the benefits of telecommunications to a greater number of Cubans,” declared Cuban telecom official Máximo Lafuente recently. “There’s no doubt that cell phones are an important foundation to the country’s development.” However, when the U.S. exempted American wireless companies from sections of the embargo in mid-2009, the move was justified as a different kind of “development.” Increased communications with Cuba is “our best tool for helping to foster the beginnings of grassroots democracy on the island,” argued an Obama administration official at the time (Miroff 2010). Poverty and the absence of sufficient technical infrastructure hinder connectivity and use. Cuba’s limited access has to be understood in that secular context. Moreover, U.S. policy has sought to hinder Cuba’s progress in that arena. We have noted that the United States limited Cuban access to email and Bitnet before 1994. Thereafter the U.S. government permitted inefficient connectivity but always stressed the necessity of using e-mail and the Internet in order to subvert the Cuban regime. Those critical of the Cuban Internet situation seldom take these conditions into account. What relationship exists between bandwidth, the trumpeted bandwidth that every now and then they bring up to explain why we Cuban citizens cannot access the Internet en masse and the censored sites? […] Why in the virtual Cuba, is censorship being repeated, intimidation, stigmatization of people because they think differently? With Internet access in Cuba restricted to the very few, the nation’s bloggers function as a kind of guerrilla underground. They work as independent agents whose existence heralds a civic reactivation that will modulate the Revolution’s Realpolitik—or is that Raúlpolitik? 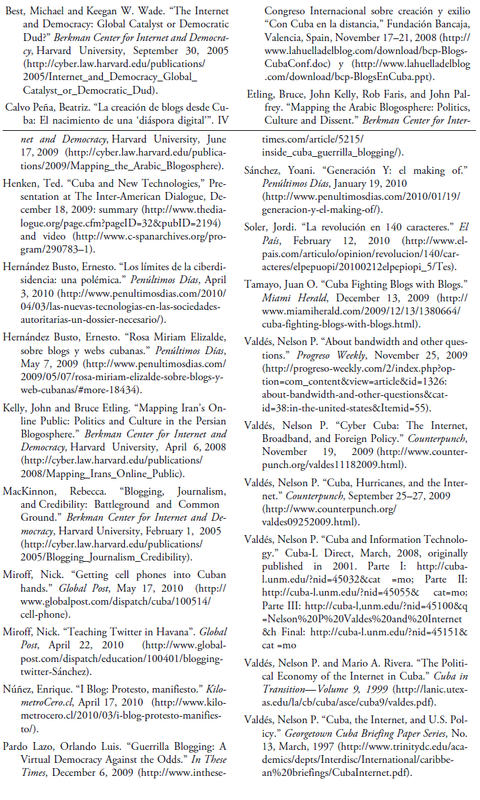 It is still too early to determine the depth of the impact of the Cuban blogging phenomenon. The fact that the government has blocked Cuba’s most influential independent blog, Yoani Sánchez’s Generación Y, now for more than two years, has repeatedly denied Sánchez permission to travel abroad, and has gradually agumented its media and physical attacks against her, all indicate that it is concerned about her growing influence. Her growing international profile and ability to sway global public opinion about the Cuban regime along with her increasingly audatious public activism for freedom of expression within the island make her simultaneously impossible to ignore and dangerous to repress. At the same time, given the extremely low level of Internet connectivity in Cuba and the fact that the government continues to control the totality of the island’s mass media, we are still far away from any so-called “blogostroika,” where the Internet and independent blogs can effectively challenge the state’s monopoly on information.